Designer Checks, online at DesignerChecks.com, is your destination for all of your checking needs. Designer Checks sells business checks, personal checks, and checks with various themes including: religious and inspirational, executive, Hope for the Cure, parchment, scenic, animals, Disney characters, Warner Brothers characters, and with or without monograms. At Designer Checks, you can also buy checkbook covers in different patterns and order deposit slips and address labels. RetailSteal.com has the best Designer Checks coupon codes, Designer Checks discounts, Designer Checks coupons, and Designer Checks promo codes. Shipping and handling rates at Designer Checks depend on the pricing of your purchase and your shipping destination. See website for full details. Exclusions may apply. Click the link to start shopping at Designer Checks now and use our coupon code to save 50% on any box of checks. Enjoy checks for the low price of $3.99 when you use our coupon code online at Designer Checks today. Use our coupon code at Designer Checks today to save 60% on a box of checks. Shop for your checks at DesignerChecks.com and save up to 15% and get free shipping. Click link to browse and use coupon code to save. With the coupon code, take 30% off accessories you order at Designer Checks. Click link to buy. 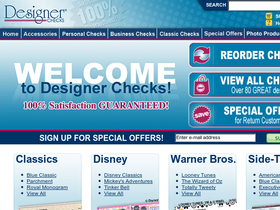 At Designer Checks, you can get a fourth box of checks for free when you use the coupon code. Click link to order. At Designer Checks, pay $7.50 per box and get free shipping and free custom lettering when you order online. Click link for savings. Pay only $15 for 2 boxes of designer checks and get free shipping, free labels, and free script at Designer Checks. Click link to shop online. Use the coupon code at Designer Checks and pay only $22.50 for 4 boxes of single checks plus get free shipping. Click link to shop. First time customers only -- pay only $5.50 per box of checks with this code at Designer Checks. Click link now.